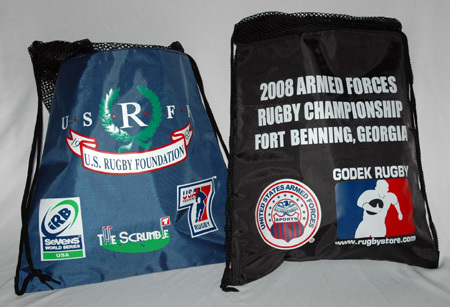 What an economical way to show your team pride wherever you go.This bag is great for tours, events, golf tournaments, school fundraisers and event gift packs. Minimum quantity of 25. Turnaround time is 3-4 weeks from final art approval. Call us at 1-800-872-7842 to get more information. This coated nylon sack pack is a great addition to any kit bag or can serve as your practice bag if you have few items to bring to practice. The large (13” x 19”) water-resistant sack pack features a drawstring closure with the drawstrings doubling as shoulder straps and plenty of space for a large screen-printed logo. This bag includes mesh at the top to add some much-needed ventilation to your gear and also includes a white rectangle on the reverse side to write your name and number.